Dogs left to fend for themselves in a natural world have no difficulty identifying what's good to eat. Their diet includes anything that creeps, crawls, wriggles, runs, swims and flies. I applaud you if you can find whole carcasses of other animals as food for your pet. However, in our modern world we need to look for alternatives. And in this regard a raw meaty bones and table scrap diet works wonders. The closer you follow the natural ideal the better. Feed whole carcasses whenever you can and otherwise base your feeding regime on raw meaty bones in large pieces from a variety of animals. However, wolves frequently depend on meat from a single prey species, for instance deer, and there are lots of pet dogs that eat chicken at every meal. Aim for 70% or more of the diet as raw meaty bones. Thereafter, the remaining percentage can be made up of offal, table scraps, and large lumps of meat or more raw meaty bones. Nature, thankfully, is tolerant and allows a range of options that provide for good health. Daily food intake varies. As a percentage of body weight, giant breeds tend to need less and small breeds need more food. Working dogs, breeding and lactating females and growing puppies need more food than do less active dogs. As a guide, healthy adult dogs usually require between 2% and 3% of their body weight in food daily. Over the course of a week, in round figures, that amounts to 15% to 20% of body weight. For example, if your dog weighs 10 kilos he will likely need between 1.5 and 2 kilos of raw meaty bones each week. If you measure in pounds weight then the sums are the same. Perhaps your dog weighs 20 pounds. Then you can expect to feed her between 3 and 4 pounds of food each week. A good rule of thumb, when feeding growing puppies, is to allow them daily food rations equivalent to 2 - 3% of their expected body weight when fully grown. Always strive to feed the raw meaty bones in one large lump. This maximises the time spent gnawing and chewing which is good for dental cleaning. It also minimises the chances of a small piece being swallowed whole and getting stuck. Healthy dogs benefit from one or two days fasting each week. Research shows that slim dogs (and people) tend to be healthier and live longer. Sick and elderly dogs and growing puppies should not be fasted. When getting started, keep it simple. Over time it's a good plan to feed raw meaty bones and offal from a range of animals. But in the first couple of weeks stick with one source. Chicken is relatively cheap and readily available. Tiny dogs do well on chicken wings and thighs. Larger dogs may need a whole chicken. And for economy, chicken frames, with most of the meat removed for human consumption, are a good source of food. What other preparation is needed? You may need a bowl in which to feed table scraps. For the main food items - the large lumps of raw meaty bones and offal - simply hand them to your dog. That's easy if you have a grassy lawn where she can dine in comfort. If your dog needs to eat indoors then feed her in the kitchen, laundry or even in the shower cubicle. By spreading some newspaper, a towel or mat you make cleanup easier. Dog's like bones very much and sometimes become protective. Do take care and discourage young children from approaching dogs that are eating. Your professional dog trainer can advise. The first time you hand your dog a raw meaty bone can be as momentous or as mundane as you choose to make it. But it will be the start of a whole new way of life for you and your pet. So, having a camera handy could be useful, as could keeping a diary. In years to come you will be able to share evidence of your pioneering efforts with your grandchildren as you look back with pride. This article is a mosaic of some of the most interesting observations I have made in more than 20 years of being a vet. Can your dog shake paws on cue? 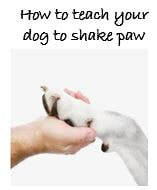 Shake is a fun dog trick that's fairly easy to teach to your dog. Most dogs can learn this trick quickly.